Old Friends Research Papers explore an intimate view of life and death in a nursing home. In the powerful, poignant study entitled Old Friends, Tracy Kidder offers the reader an intimate view of life and death within a nursing home in Massachusetts. Over the course of a year, Kidder came to know residents, their loved ones, and the staff of Linda Manor. The rich tapestry the author weaves and the way he weaves it makes the reader feel as though she or he knows the main characters as well. One comes away liking some of the residents more than others and with mixed reactions regarding certain family members and staff. But perhaps most importantly, Kidder provides a real-life example of the socialization process as it evolves in this microcosm, essentially self-contained and somewhat isolated from the rest of society. Socialization can be described as the process through which members of a social group learn the roles, statuses, and values necessary for participation within the group. As applied to the nursing home setting, then, this concept would involve how residents, their families and friends, and the staff learn their respective roles and statuses. Also, the value system of a facility designed primarily for long-term care until the end of life for its residents is important to an understanding of the various roles and statuses that evolve. Certainly, laws and rules provide a “foundation” upon which roles are “built.” Yet participants in the ongoing life within Linda Manor learn their respective roles largely through interaction with one another and from observing others who occupy roles and statuses similar to their own. Perhaps what makes this particular milieu more challenging from a sociological perspective is that the clients have come from long lives spent in other groups within which they have been socialized to other roles and rules. At the end of their sojourn here on earth, they find themselves in a very different environment – and adjustments are often difficult. 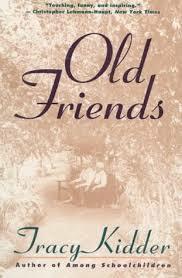 Kidder presents a wide range of “characters” in Old Friends. Linda Manor represents a reasonably representative cross-section of the larger society outside its walls. Lou and Joe are the featured residents. Earl provides one example of a patient who has particular difficulty adapting to his new role. Earl is a very active man until his heart attack some months earlier, Earl still hopes for recovery and a return to his fulfilling life outside the facility. He does not install a phone because he vows that he will be back home so soon that it would not be practical to do so. Each week he seems to target a particular day in the upcoming week on which he is certain to be released. But he is disappointed again and again, and his health continues to decline. Soul of a New Machine - The Soul of a New Machine by Tracy Kidder follows the development of Data General, a microcomputer developer that began operations in the late 1960s. Among School Children - Among School Children by Tracy Kidder (2001) is a collection of vignettes that follow a class of elementary school students headed by Mrs. Zajac. Theories of Aging - Theories of Aging research papers discuss the two main theories of aging that explain senescence. Abuse in Group Homes for the Elderly - Abuse in Group Homes for the Elderly Research Papers examine a sample of an order placed for a nursing class for an evidence based clinical project. Depression in the Elderly - Depression in the Elderly research papers discuss the issue of depression that results from a major life change during the geriatric stage of life. Paper Masters writes custom research papers on Old Friends and explore an intimate view of life and death in a nursing home.